When it comes to experiencing a great outdoor fun in Branson, nothing is more fun than enjoying winter in campfires and s’mores. S’mores was popularized by the Girls Scouts in the late 1920s. This simple treat hasn’t lost public interest and, in fact, it’s constantly tinkered with chef-driven restaurant. The annual celebration of National S’mores Day is August 10, but let’s be honest, every time you camp in whatever season, it should be a day to celebrate and munch on these addictive treats – that’s why you always want “some more,” right? When roasting the s’more, you just need to put a marshmallow on a stick, toast it, and you’re done. While this is definitely the basic idea, if you’re looking to make the perfect s’mores possible, then you need to know some tips. From how to properly melt your s’mores chocolate to what you can use if you don’t have a fire pit or grill, these tips will ensure you bring your s’more a game this winter. Use a stick or two to keep your marshmallow in place. Never underestimate the heat that you can make. Whether it’s a grill or a campfire, you should stay at a comfortable distance. Using a stick or skewer allows you to stay warm. When you double your skewers like you would for kebabs on the grill will keep the marshmallow from rotating over the fire on its own and toasting unevenly. Don’t let the marshmallow catch on fire. When it comes to toasting marshmallows, it’s about personal preference. Whether you like a perfectly golden, intact ’mallow or a charred, black blob, you always have the right to create the marshmallow of your dreams. You should toast more than one ’mallow at a time. This way, your s’mores will be even more outlandishly tasty. When you want your chocolate to melt faster, use a melting block. Just set a scrap of 2 x 4 inches wood at the edge of your fire (away from the flame) where it’s nice and hot, and place your graham cracker topped with chocolate on it. 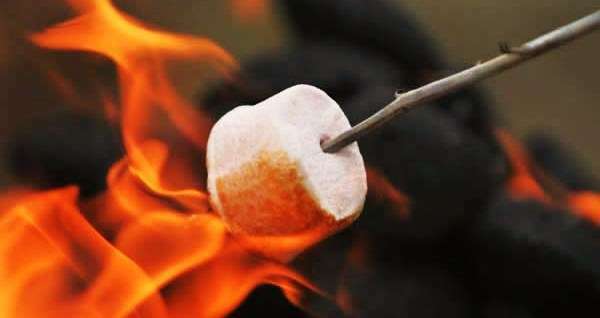 While you toast your marshmallows, the cracker will get warm, and the chocolate will start to melt, giving you the perfect bite once you add your ‘mallows. If you like hands-off s’mores experience, bring some sugar cones on your next camping trip. Stuff them with chocolate chips, marshmallows, peanut butter, fruit – whatever you prefer. Then wrap them in foil, and place them over hot coals, turn it occasionally, for 5 to 10 minutes. You’ll get an ooey, gooey treat you can eat just like an ice cream cone. It’s also great to add a fruit like banana to your s’mores. Split open a banana, and stuff it with the s’mores ingredients you prefer to use. Wrap it in foil, and place on the grill for about 5 minutes, until warmed through. When you want to experience a great outdoor fun in Branson this winter, learn some tips on how to roast the perfect s’more and enjoy camping.